Logan Sports Marketing have been working closely with EY on activating their ‘Official Business Advisor’ status with Rugby World Cup 2015. 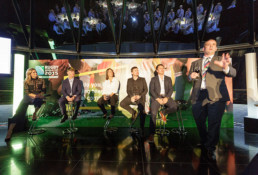 To celebrate the beginning of the Rugby World Cup, LSM worked with EY to create a bespoke event allowing EY to entertain their most prestigious clients in a unique setting among rugby stars from around the globe. The guests were joined at dinner by rugby royalty, Brian O’Driscoll, Katy McClean, Tim Horan and Phil Vickery. Our very own Kenny Logan also joined the line up! The event took place at one of London’s most iconic venues, Searcey’s The Gherkin. Guests enjoyed panoramic views of the city during the drinks reception, before a fine dining experience at the very top of The Gherkin. Guests were treated to quick interviews with the rugby stars throughout dinner, hosted by the fantastic Gabby Logan and mini EY branded rugby balls were placed on each place setting. After dinner, once coffee had been served and wine glasses filled, the panel took to the stage. Gabby lead a question and answer session with the rugby stars along EY’s leadership theme and the stars shared some amusing stories about their lives and careers in the rugby world, as well as their predictions for Rugby World Cup 2015.